“In high-stakes games, you have to be able to forget the value of money, otherwise you can’t even play,” said Ilari Sahamies, a man who regularly raises a pair of diamond earrings pre-flop, leads the flop with a Mercedes, bets the turn with a Rolls-Royce, and shoves for a four-bedroom house on the river. A regular in the biggest live and online cash games in the world, Sahamies built his reputation and his bankroll on aggression, fearlessness, and his now-legendary chat box rants where he’s offered some choice, unfiltered, and rated-“R”-for-language comments about his opponents. Sahamies looks as tough as he plays, his head cleanly shaven and often covered with a hoodie, his face giving away no emotion. Ilari Sahamies was born in 1983 in the Finnish capital of Helsinki. As a youth he excelled in sports, including soccer, wrestling, and diving. In his early teens, though, his primary interest shifted to billiards, where he twice won the Finnish Junior Championships. When he was 15, Sahamies got his first taste of poker, catching a segment on Texas Hold’em on a Finnish TV talk show. Eager to try it for himself, Sahamies found a home game through some friends from the billiard halls, including a young man named Patrik Antonius. Sahamies was so hooked that poker began to significantly detract the high-schooler from his studies. Sahamies began skipping school to play, even ducking in and out of the country at times. At 18, he finally graduated, and instead of going on to college, he began playing live at the Grand Casino Helsinki, typically $5/5 pot-limit Omaha. The poker boom had yet to hit America, let alone Europe, when Sahamies started beating up the cash games at the Grand Casino Helsinki in 2002. Soon afterward, he discovered the burgeoning online poker scene, and signed up for accounts on several sites. Sahamies started grinding it out at $50 buy-in no-limit hold’em and pot-limit Omaha. He moved up in stakes at lightning speed, going broke several times along the way due to poor bankroll management and playing higher limits too quickly. Sahamies always managed to recover and grind his roll back up, his hyper-aggressive style of play yielding him more than his fair share of pots. Sahamies would play long sessions, spending many a long, frozen winter’s night multi-tabling for as much as 15 hours at a time. As the poker boom took off any many of his peers began traveling the tournament circuit, Sahamies remained focused on the cash games, and continued to move up in stakes. Already a regular on PokerStars , Prima, and other European sites, Sahamies opened a Full Tilt Poker account in 2006. Playing under the handle “Ziigmund,” he quickly became a fixture in the largest games available, which in those days were $25/50 and $50/100 no-limit hold’em and pot-limit Omaha. As the size of the games grew, so did Sahamies’ bankroll. The $50/100 game turned into $100/200, which turned into $200/400, which turned into the $500/1,000 heads-up and short-handed games that continue to be his bread-and-butter today. 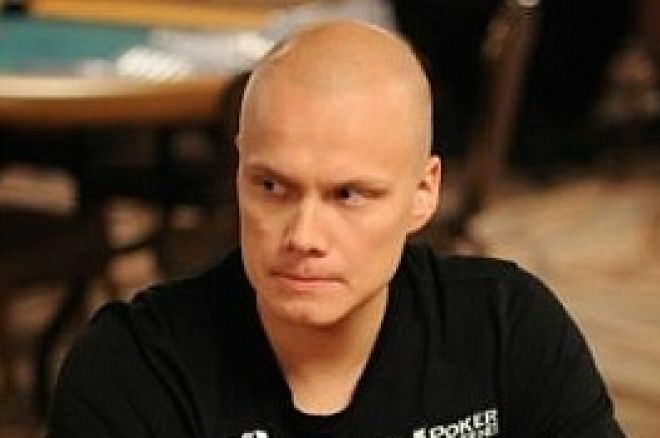 Sahamies took on the online cash game elite, including Tom “durrrr” Dwan, David Benyamine, Phil Ivey, Gus Hansen, Phil “OMGClayAiken” Galfond, and even his good friend Patrik Antonius and won, booking more than $1.6 million in earnings on Full Tilt Poker alone during 2008. In the first half of 2009 alone, Sahamies has added another $2.2 million to the till by playing on Full Tilt, the vast majority of it earned in the $500/1,000 HA games (PLH/PLO). On May 23, 2009, Ilari Sahamies found himself on the winning end of the largest pot-limit Omaha hand ever played online, the pot coming in at a mind-blowing $702,926. Sahamies was playing a round of $3,000/9,000 PLO with Tom “durrrr” Dwan, sitting at a $500/1,000 heads-up table, but agreeing to raise and reraise the pot pre-flop on each hand. After Dwan made the compulsory opening raise to $3,000 and Sahamies put in his required reraise to $9,000, Dwan pushed the action with a four-bet to $27,000. Sahamies called and they saw a flop of . Both players checked and the hit the turn. Sahamies led out for $54,000, Dwan made it $216,000 to go, and Sahamies moved in for his entire $324,463 stack. Dwan called, having him covered, and showed for a queen-high flush draw, a gutshot straight draw, and a pair of tens. Sahamies was a 3-to-1 favorite, however, with for a jack-high straight and two pair. The river improved Sahamies’ hand further, falling the to make him jacks full of sevens, good for the nearly $703,000 pot. Already a legend online, Sahamies increased his public profile further in 2009, appearing on the fifth season of GSN’s “High Stakes Poker” as well as the 2009 NBC National Heads-Up Championships. Though he rarely plays tournaments, Sahamies did manage to make a runner-up finish in the €2,850 buy-in Main Event at the Helsinki Poker Championships, earning over € 125,000. Though he does travel frequently to Las Vegas and around Europe for cash games, he still calls Helsinki, Finland home.